Saudi nationals have now adopted what started out as mostly an expatriate sport, diving the Red Sea. However, international tourism has ceased after the Kingdom withdrew tourist visas. You can dive year-round along Saudi Arabia's Red Sea coast. The heaviest rainfall is between November and January. The sea is always warm: the coldest month is February and even this has an average monthly water temperature of 23 °C. The weather top-side gets very hot. The maximum average air temperature is over 35 °C from June to September (source: BBC). Soft Corals, Photo credit: Tim Nicholson. The main diving areas are around Jeddah and Yanbu which is 300 km north. There are also some good reefs south of Jeddah. Some of the shore dives in Jeddah have been heavily spear fished (even though spear fishing is banned) and there are also problems with coastal developments polluting the water in some areas. However there are many more fantastic dives, full of life, and numerous wrecks. One of the best dives in Saudi Arabia. Not just because for the coal-fired ship that lays on its starboard side at 18 m, but because of the overall dive profile offered at this location. The dive boat drops the divers off in open water 50 m west of the wreck where they descend to the first shelf wall 45 m below. A short exploration of this wall reveals large sea fans one meter in diameter gently swaying in the current, black coral bushes host to crustaceans and small fish, and soft corals of pink and scarlet red. A light is required to see the vast array of colours at this depth and to see into the small cavern. On any given dive sharks, manta rays, and large carnivorous fish like bonito, blue fin jacks and kingfish may pass along the wall. 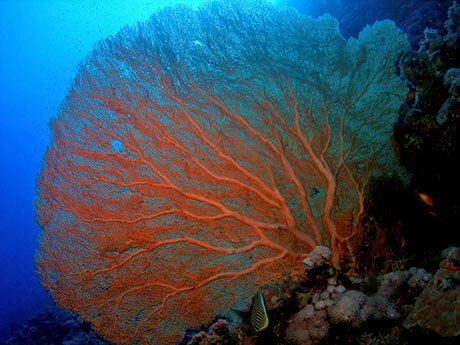 Sea Fan, Photo credit: Tim Nicholson. It seems as if you just arrived when it is time to ascend to shallower depths. The shelf gradually slopes towards the wreck and a normal swimming rate matches the required ascent rate perfectly. Divers arrive at the screw of the wreck with plenty of bottom time to see the resident moray eel and other aquatic life around the ship. Like other shallow wrecks in the area the surge of the waves above have taken their toll on the hull. Little is left intact except for a small section of the stern and the two boilers for which it is named. As she ship most probably has been down for over 100 years the coral attached to the dismembered hull is as abundant as it is varied. On this dive the ascent carries on forward to the bow that is lying in less than 3 m of water. By circumventing the bow, the diver will swim into a crevice in the reef and find himself in a tunnel leading through the coral to and open pool that is 15 feet deep. There are a series of caves that penetrate the shallows of the reef in four directions, each offering bizarre coral formations and a laser show of light through the small openings from above. The current and surge can be strong. As the depth is only 3-6 m divers may spend as much time as their air allows before being jettisoned through the short but dark cave leading to the canyon south of the wreck and the dive boat moored above. 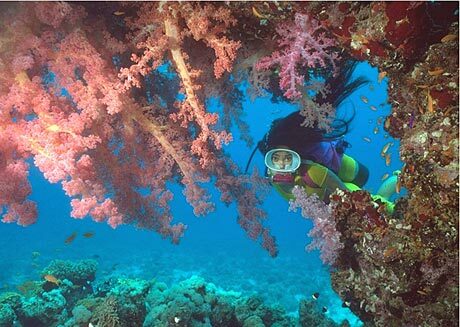 It is easy to see why this is the most popular dive offered in Jeddah. This site is a torpedo shaped sea mound that is 200 Metres long and about 20 Metres wide at its widest point in the middle. Located between the Old Kings Palace and the South Elisa Shoal Marker in the middle of the inter-coastal shipping lane, the mound rises out of the 365 m bottom to a depth of 14 m at the surface. The north and south end taper in and down to the depths below with current varying in speed generally from the north, although no current, or currents from the south, are not uncommon. Ala's Reef is one of the best places to see sharks and large shoals of fish. It is often it is dived twice in a 21 dive package. Seldom are divers disappointed, the visibility is usually above the average of 30 m and the fish come out to play, especially with a strong northern current. A favourite dive scenario is to descend to 27 m on the southern tip and just wait for the fish to do their thing. There are always large schools of Black Triggerfish and baitfish like Sardines. These attract Yellowfin, Bluefin and Dusky Jacks, also Trevally, Queen fish, Mackerel, several varieties of Tuna, and Red Snapper. These are open water pelagics that prey upon the reef in a great show of their speed and angling skill. Nigel, Lunartail and giant Greasy Grouper slowly patrol the bottom, edges and coral outcroppings of the reef, and occasionally in a flurry attack some unsuspecting prey. Parrot, Surgeons, and Unicornfish abound. Trevally, Photo credit: Tim Nicholson. While the fish mentioned represents a rainbow of colours and a diversity of swimming and hunting skills, it is the larger fish like Humphead or Napoleon Parrotfish, Barracudas, Eagle Rays and Sharks that bring divers to this location. Ala's reef is one of the few places to see Hammerhead Sharks with their eyes protruding from the extensions of their heads looking nervously at you when they cruise by. Oceanic Whitetips and Tiger Sharks, are commonly seen plying the deeper waters along the shelf. Smaller Whitetip Reef Sharks are usually seen on the top of the reef and occasionally Manta Rays. It is best to dive here early morning before the seas get up and during the full moon cycle so the currents are really moving. Claimed as the best soft coral wall in all of the waters off Saudi Arabia is the 150 m section of the Redmah Wall. Located on the northern end of the marker at Redmah Reef. Usually this dive is made after a visit to the outer reefs therefore the seas are usually rough, so it is best for the boat to drop divers off and let them drift along the wall towards the marker. After circumnavigating the coral heads at the front of the reef, the diver is confronted with a deep channel and vertical wall that parallels the reef. There are small channels to explore, that penetrate a few metres into the reef, and like most reefs it is best to drift along at 9-12 m to see the most reef fish and have the best colour. There is hardly a square meter to be found that doesn't have soft corals of some description and because there is a deep channel several species of sharks, and pelagic fish have surprised the unexpecting diver. Photo credit: Captain Victor Organ. There are Nudibranchs, Starfish, spotted Hawkfish, Gobies, Feather and Basket Stars all of which are either attached to or semi-hidden in the coral ready to pose. The wall offers sun silhouettes; back lit soft corals and unlimited choices of wide angle, close-up or microphotography. A little deeper there is a forest of whip coral covering 30 or more square metres of the hard coral bed. The dive is not over once you have passed this soft coral mass, for the landscape changes back in forth, from walls with small tunnels burrowing to the surface and coral outcroppings, to short shelves with scattered coral heads and huge Tabletop Corals all delicately coloured in blossoms of Soft Corals and clusters of Sea Anemones with yellow Clownfish fussing about in their tentacles. It is not uncommon to see three or four Blue Spotted Rays on these sand shelves or as many Moray Eels lurking holes and under the coral ready to strike. Upon surfacing the dive boat picks the divers up along the wall. "This wreck sits upright in depths of 27 m at the stern to just below the surface at the bow. The shallow depth accounts for the broken up condition of the wreck as the heavy seas have been wrecking havoc on the vessel since it went down in 1977. The cargo holds are empty as the cargo was removed in the effort to re-float the ship off the reef. You can penetrations into the galley and electrical room were made and as the seas were calm, the whole wreck was surveyed by the divers from bow to stern." Captains Log, Sunday April 25, 1999 Jeddah. The above entry was from the first Familiarisation Trip made by the European Tour Agents and is typical of what may be expected when visiting this wreck. If the visibility is not good here, then it's best to pack your lunch and go home, for it won't be good anywhere. There can be high swells when mooring on the buoy above the wreck, which can be irritating to any passengers left on board. Usually the boat pulls up on the leeside of the reef for the briefing and suiting up. This way the time exposed to swells is much less for the divers. A note of caution, the swells can cause sections of the broken up ship that weigh tons to move as much as 3-5 feet. In most cases divers can see and even hear the twisted metal moving moaning as the sea steadily claims her own. It is not wise to dive under these masses of metal or to be trapped or pinched between moving plates. The same goes for wreck penetrations that are risk in good conditions... they could prove fatal in bad circumstances. Proper training like Wreck Diving Specialties and common sense is well advised.
" I've dived most of the wrecks with Ann Ann being my favourite, start at the stern at 32 m and work your way up to 5 m at the bow. " 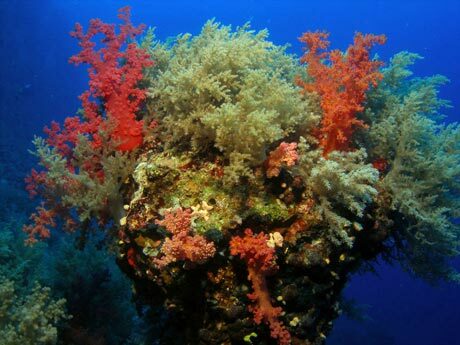 Perhaps the best example of coral heads covered in soft corals available off the Jeddah coast is the KLM Reef. Named for the Dutch carrier crew that was on board when it was first dived. These coral heads lay in 18 m of water along a wall that slopes to 65 m at the end of Horseshoe Reef so named for it's shape. There are 14 in all varying in size from a few metres in diameter to over 30 metres. Sharks, Humphead Parrotfish or Wrasse and the full array of pelagic fish may be viewed along the drop off, but for sure Blue Spotted Rays, Grouper, and Red Snapper will be found cruising the channels between the coral heads. The Staphonos Wreck lays on it port side and is the most intact wreck in the area, and it is well known to have the some of the best visibility as well. It is possible on a good day to photograph the full length of 287-foot ship. Staphonos was name of the ship when it went down in 1978 but it was first christened the Constable and is nicknamed the Cable Wreck for the cable cargo she carried. There are steel beams, corrugated sheets of asbestos and chain link fence in the cargo holds as well. A Guitar Shark lives near the bow and white tip sharks are commonly seen out along the ledge. 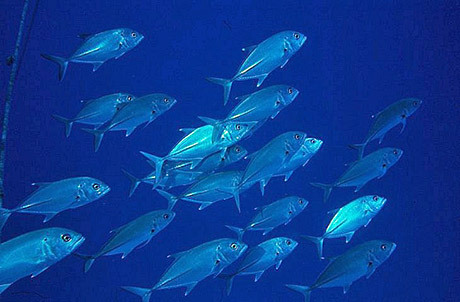 There is always a large school of Goat fish and Blue Striped Snapper hanging out at the mast amidships. The ambient light from above naturally lights the cargo holds so the divers can swim through without lights, and even the bridge is accessible if you are careful. This wreck is the best to photograph to acquire good quality wreck pictures. On the swim back to the cut where the coral gardens, Angie's Hole-in-the Wall has blooming with soft corals and a small sea fan gently rocks to the current. The divers surface in the middle of the cut after exploring these coral heads were made so famous for their beauty by the American photographer Woody Pridgen and his wife Angie. "10km north from Jeddah coast. Leading to the most amazing coral garden I have ever seen in my life. Like 70 foot termite mounds out of the out sand they are home to masses of diverse species from reef sharks to Blue spotted Rays and Barracuda. In one reef mound was the most enormous spotted eel I have ever seen in my life. with a 3 foot girth she was anything between 20-30 foot long. Vicious tidal swells can hit you between the corals. You must be a strong swimmer and go with local dive team who have knowledge of area. AN ABSOLUTE MUST. Great visibility. usually 200ft easy. Best go out early half of year. Sandstorms postpone boats after August. Sandy Base with rocky outcrops and drops into a bottomless abyss. " "Certification class but everyone tells us we had the Taj Mahal class location. Lots of coral and plenty of fish. Water is warm. A little surge action due to the coral heights and the waves breaking at our entry point. It was a shore dive but almost a boat-type of entry. Terrain went from pool-like 15 feet depth to 100+ in the space of 30-40 meters. Sorry to mix measuring systems but I'm US military and we use both a lot. Outstanding value for money." "Great beach dive site: Marlon, friendly PADI instructor resident. Dives from 30 ft to 120. Superb Coral Garden, Eels, rays, Lionfish, Clownfish, Napoleons, Triggers, the occasional 9 foot shark, bull shark rarely, can hear dolphins talking. Followed a turtle, Octopus, and scores of other small species, pipefish, many poisonous chaps too, plus for night diving, 12 inch starfish (red) lobster, you name it, and a great restaurant. Visibility normally 50 ft good, 70 ft great, sometimes 10ft if choppy. Best time of year May - June. Can get occasional surges and rough tides in winter. Sometimes not diveable in winter due to low visibility and rough tides, but like a millpond in summer. " "I went for work. Could only dive either shore or day boat from Jeddah. The shore dive from the Sheraton beach club Jeddah. Considering where it was it was a good dive. The price about a quarter of a shore dive in Europe. Found an operator who had a day boat running on the weekends. Again very good value. The dives were ok. Probably not up to the standard of other areas in the Red Sea. It was at least 3 years ago. " "An exceptionally difficult wreck to reach as it is in the shipping lanes outside the Port of Jeddah, however with private hire and gaining permission from the government it is possible. First thing that strikes you as you arrive is the fact that it is not just one wreck, but three, two with their bows exiting the water. As this is a restricted area it is impossible for fishermen to reach the area, so other than the large boats that smashed into the reef 30 years ago it is undamaged, and teeming with life. The position of the wrecks with regard to the port is also a great benefit. Far enough away that it is unaffected by the rubbish been thrown overboard from the boats, but also gets the sharks...lots of them...silkys, hammerheads, lemon, reef, and tigers. The reef and wrecks will keep you entertained for 3 dives easily, and you will want to go back. The best kept secret in the Red Sea! " "Scuba diving in Jeddah is really fun.it can be done the whole year through. All the dive sites that I have viited were amazing. still there are plenty of dive sites to be visited.spending time in jeddahs resort ,one of those are Bahdur,Sheraton ,La plage and ,Fal snorkling and scuba diving can be enjoyed .liveaboard diving is my next plan.If you are in Saudi Arabia do not hesitate to snorkel and dive .its one of your experience that cannot be forgotten." "I live in Jeddah and dive almost every weekend, it's the only thing that keeps you sane here in a stifled country. Sadly the reefs off Jeddah are being poisoned by pollution pumped in to the sea either from the diesel stacks or the pure effluent discharged into the sea. Quite a poor state of affairs since Jeddah is called the bride of the Red Sea, maybe a female spider that kills its mate. I've dived most of the wrecks with Ann Ann being my favourite, start at the stern at 32m and work your way up to 5m at the bow. Spearfishing is banned in KSA and the port officials try their best to prevent the idiots from killing for fun but has been stated before its a natural state of affairs in Saudi to kill nature and cover it in concrete so the killing in the sea doesn't surprise me. At least I get the chance to see the last of the great Red Sea reefs. Another problem is overfishing by the expats from places like the Philippines. Difficult to blame them as they get paid so little its one way of supplementing your weekly wage. Lets hope that the authorities realise soon and do something for the future, but looking at coastal development killing the reefs off is not a problem.... "
"As the wife of an expatriate in 1981 I was privileged to be able to learn to dive from the shores of Jeddah. Tough wading out to the reef but it has to be some of the best diving I have experienced and believe me I have dived all over the world since then, including the Galapagos Islands! I really want to return and relive the dream. Lynne Harris "
"I have been diving in and from Jeddah for 3 years now. Last time I dived the reefs were empty - no big fish of any type. Dive buddies have independently come to the same conclusion, that is, the fish have all been killed by mainly spearfishermen with scuba tanks, witnessed this form of "sport" a few times while diving. So no longer are the reefs pristine, they are dead when it comes to fish species. Unfortunately no authorities will take action to control and few dive operations step forward to preserve the fish and the reefs. Sad but true, kill everything seems to be the norm in Saudi, sea or on land. " "Woww Jeddah is nice place for diving, I have been there 2010 "
"I spent a year in Jeddah and dove about every other weekend. We would grab some tanks at a dive shop in Jeddah. The area where we dove most was a stretch of deserted highway south of the city. All along the highway a reef parallels about a quarter mile to 200 yards off the beach. The catch is that we had to walk that distance in waist deep water to reach the reef and deep water. The reef was terrific no matter where we went in. There was more sealife than places like the Sheridan that was heavily dived. The boat trips were at least as good and often better than the highway. We also went on a trip to Faricone Islands further south. It was a rough trip involving tents and rough boat rides. There were more big fish and some more species to see. Vis was not very good when we were there. That, in a nutshell was my Saudi experience. These are all free (no fees or licenses) dives, but you pay with a little sweat. You must walk out to the reef in thigh high water and manoeuver over the reef to get to the drop-off of 10 to 40 feet. But, it is well worth it. The dives are beautiful in the Red Sea tradition. " "Bity murky, low viz, max depth 30 ft, sandy bottom, but they have dumped a load of wrecks down there to attract the fish. One monster. They like sausages, but keep your gloves on because they cannot tell the difference between your fingers and bangers. " "Went diving in Yanbu with our expat friends. Lived in UDH camp and flew over to the area with my husband and children. We drove to a location on the edge of the sea and entered from the shore. We were able to see amazing fish and colorful coral. The best diving I have ever done. " "The Red Sea close to the port of Yanbu has some of the best untouched reefs in the world. 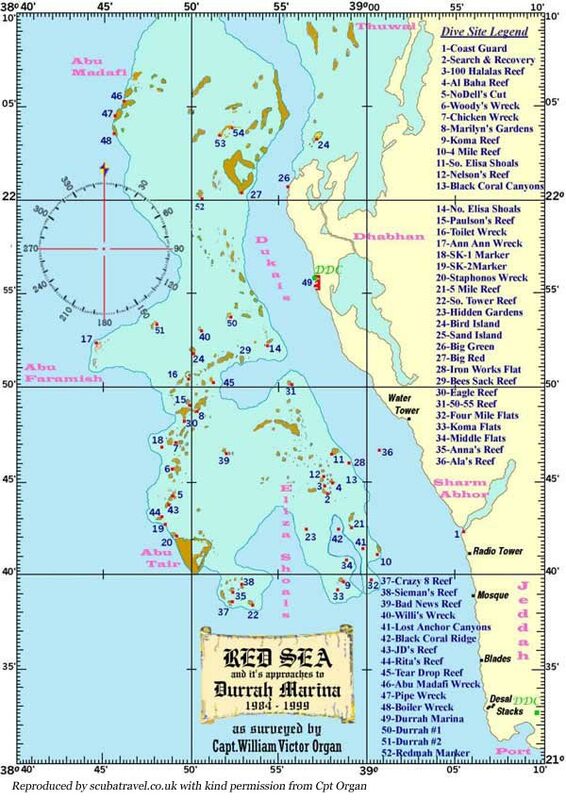 KM99 and the Coast Guard port allow you access by land directly into the Red Sea. Many small wrecks, grass beds and endless outcroppings give you hours of diving and snorkelling. I promise that this would be the trip off a lifetime... "
"I lived in Yanbu for 2 1/2 yrs and learned to dive there. There were always folks from Jeddah who drove 3 hrs each way every weekend to dive in Yanbu. If you go to the trouble of diving in Saudi I would might stop in Jeddah but would go to Yanbu. Go to the Seven Sisters or Reef 41 for a special time. You will need to be in one of the speedboats out of the RC Marina to get there. Arrange at a local shop. Also there are two wrecks to the north a bit but I am not a wreck fan. " "The Whale Shark season in the Farasan Banks is starting (March to June) soon don't miss out contact Dream Divers Jeddah not the day boat operation the liveaboard section they will organize your trip in partnership with Sea Demons Dive Club." Our thanks to Capt. Victor Organ for his contribution to this page. In 1977 my husband and I had 6 weeks of lessons for PADI. We took our qualifying dive in Saudi Arabia. We did so many dives about 20 miles north of Jeddah. I wish now we had a boat but all we had was a rubber raft. My husband took up underwater photography. We use to develop our own slides. I took all the land shots. There was so much to see. It was the most beautiful, untouched reefs I think I ever saw. Colors so vibrant and fish so plentiful. I used to take cans of cheese whiz down with me. Small and large reef fish would come up and feed. I would just sit and pet these fish while my husband ran around taking pictures. It was kind of comical. We dove there by the (I think)3 Palms near the Kings palace. Sometimes we went south of Jeddah quite a ways. It was not really a wall dive. 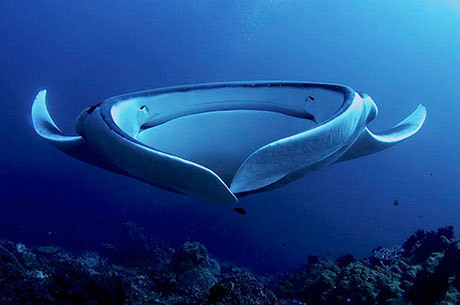 It was more of a bottom dive in about 60 ft. Had a small manta ray 200lbs pass over my head and circle us. Saw sea turtles there too. Photo credit: Arturo de Frias Marques. CC BY-SA 4.0. A bunch of American divers that worked in Jeddah got together and dove. It was fun. We did go to Yanbu north of Jeddah about four hours. People we knew went diving on a wreck in about 90 ft. So we went with some other divers we knew. It was near a coastguard shack. We saw a bunch of clay pot that dumped in a pile all fused together. Saw pieces of a wooden boat. The people who discovered it the year before said there were pots big enough to stand in. They took a piece of wood to have it carbon dated in England. The wood was 800 years old. That was pretty cool. Sometimes we would go night diving not far from Jeddah but that wasn't really my favorite diving. I always felt like something was looking at me as a meal. We did do daylight diving before he would go to work near Jeddah. It was clear water there but not as pristine as farther north. That began our diving for the next ten years. We dove in many places. We dove off the coast of Africa in the Indian Ocean, we dove all around Florida, in the Caribbean around the Caymans and our last trip was a private 7 day cruise around Belize. My husband died in 1988. I lost my interest but not my love of diving. Does that make sense? We had a wonderful life. I envy all these young people their adventures. by Nicolas Buchele, Paperback, 168 pages, 2008. In the main devoted to Egypt, but also covers Saudi Arabia. Please add your comments on diving in the Red Sea, or anything else on this site. Do you want to recommend a dive operator or particular dive? Let us know.